Escape is exactly what we did. The weather forecast warned that records would surely break as we packed up and fled the unseasonably warm temperatures of Southern Oregon. The tide was coming in so we kept to the road on our mid-day walk. There is nothing quite like camping in Oregon State Parks. Campgrounds and facilities are clean, tidy and located in beautiful spots. 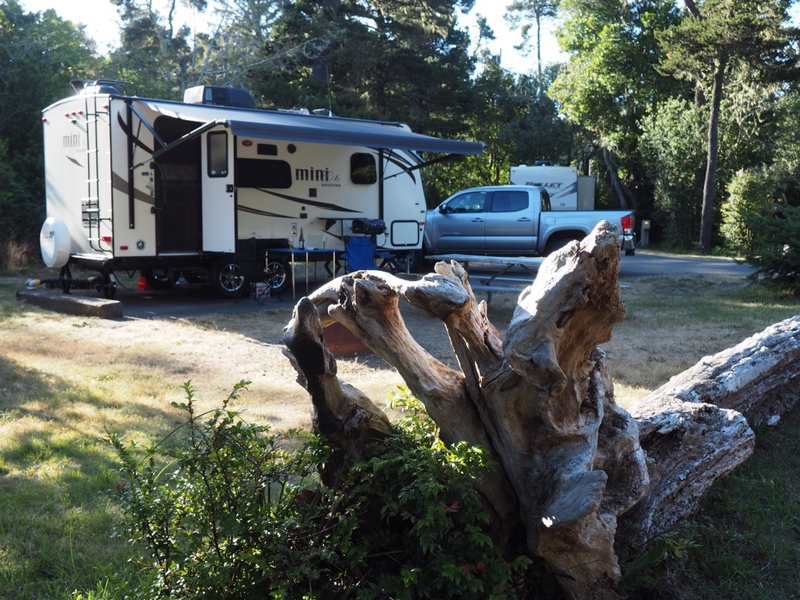 Bullard Beach State Park offered us the perfect location, not too far from civilization, for our first experience living the trailer life. Reg was reminded what a workout it is to walk in the sand. The campground is located just over a mile from the shore so be prepared to get some sand in your shoes. The trail took us up and down through the trees, eventually opening on to grass covered dunes. There are plenty of trails for hiking or biking, plus 11 miles of designated equestrian trails that spring from the park's horse camp. The Coquille River Lighthouse still stands guard at the mouth of the river. 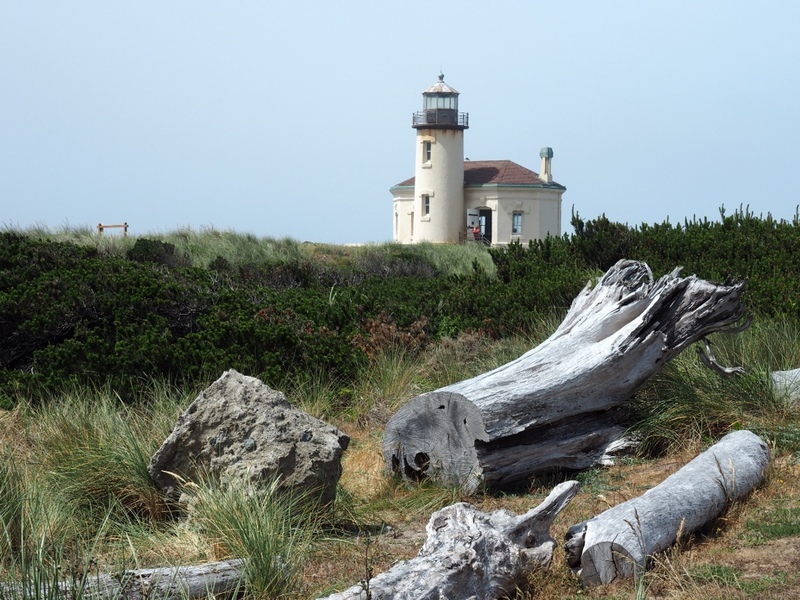 The high point of our day was the six-mile round trip walk to the Coquille River Lighthouse. Built in 1896, it was decommissioned in 1939 and no longer serves as a navigational aid. Inside are interesting historical displays and a small gift shop. However, they don't sell any food, so if you walk out to it like we did, don't forget to pack your snacks! Renovation efforts are ongoing and donations are greatly appreciated. Campsites are nicely spaced and most provide a minimum feeling of privacy. Each of the three loops of campsites surround a central restroom/shower facility so this is a great place for tent campers as well as RVers. 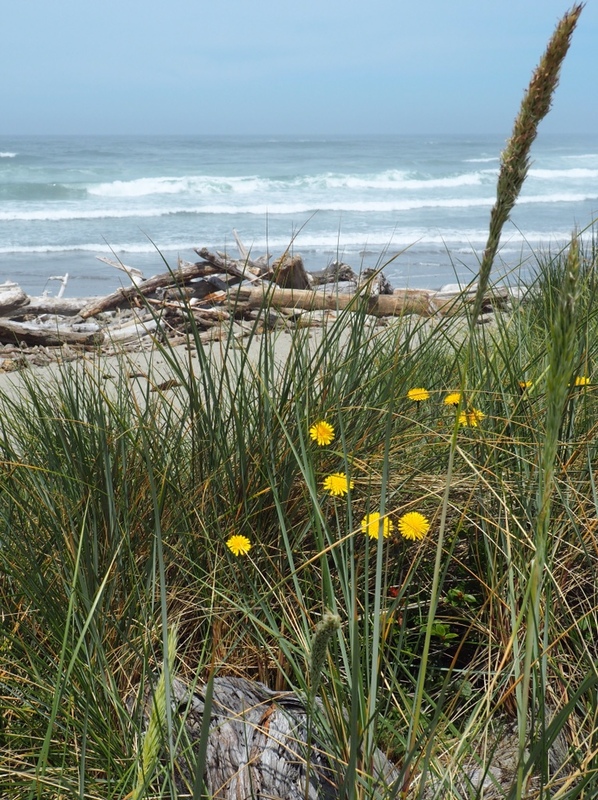 Yurts are a fun alternative to traditional camping and Bullard Beach has 13 available for rent. You'll need to supply you own bedding and whatever is needed for cooking, but you will be up off the ground with a roof over your head, a bed/futon to sleep on, lights, heating and a lockable door. 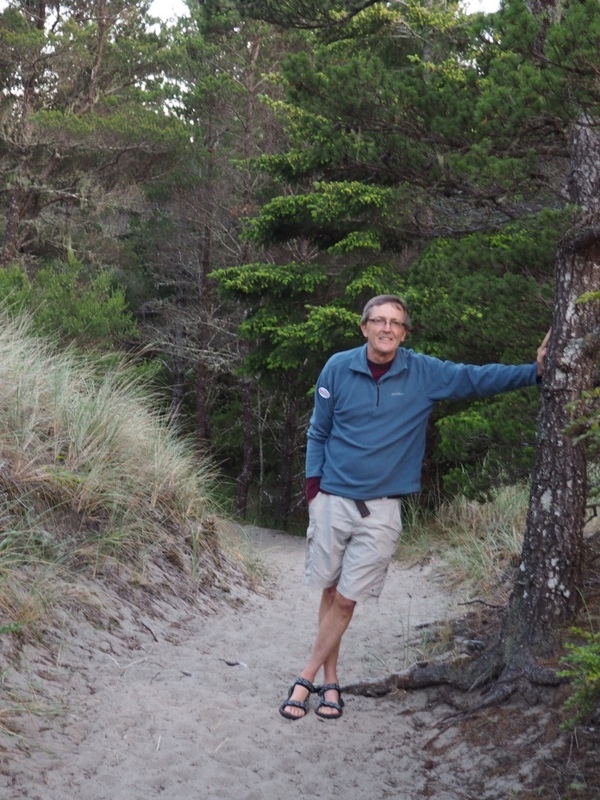 Reg and I spent a couple nights in yurts along the Oregon coast several years ago. We loved their rustic comfort. Isn't it time for you to plan your escape?